Peanut butter and chocolate. Cats and balls of yarn. T-Shirts and Baseball caps. Some things are just better together and this bundle is no exception! 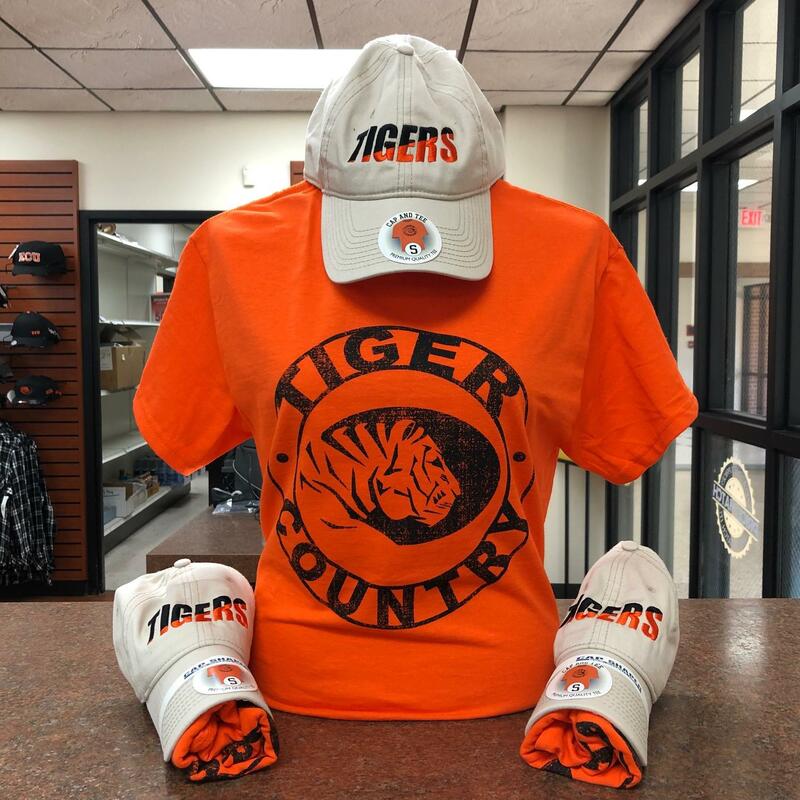 Set includes one orange, 100% cotton T-shirt with "Tiger Country" and ECU Tiger logo printed on the front in black and one tan, canvas, baseball cap with "Tigers" embroidered across the forehead in black and orange. This item comes in sizes S-5XL as well! Please select option for Cap and T-Shirt Combo. Fast-drying and lightweight material makes this shirt perfect for any work-out-enthusiast. Perfect to wear on its own or as a light layer. 100% Polyester fiber content with "TIGERS" and the Nike logo printed across the chest in orange. Please select option for DriFit Long-Sleeve T-shirt. Fast-drying and lightweight material makes this shirt perfect for any work-out-enthusiast. Perfect to wear on its own or as a light layer. 100% Polyester fiber content with "TIGERS" and the Nike logo printed across the chest. Available in gray or orange. 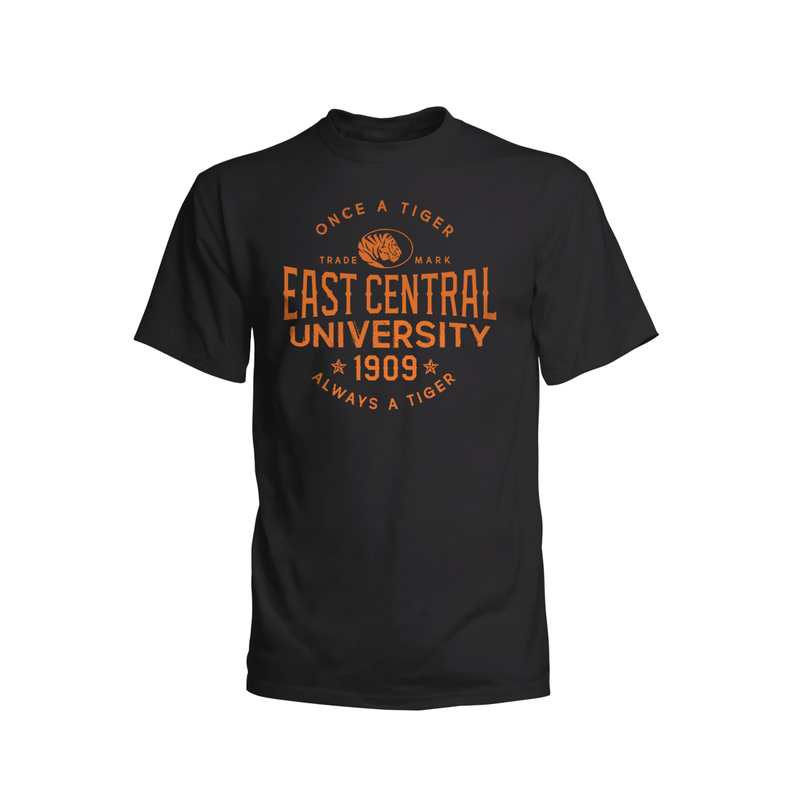 100% cotton T-shirt with "East Central University", ECU Tiger Logo, and university's establishment date printed on the front in orange, black, and white. T-shirts available in orange, black, or gray. Please select option for ECU Est. Date T-Shirt. Super soft and flowy. 100% Cotton fiber content makes the shirt comfortable and breathable. 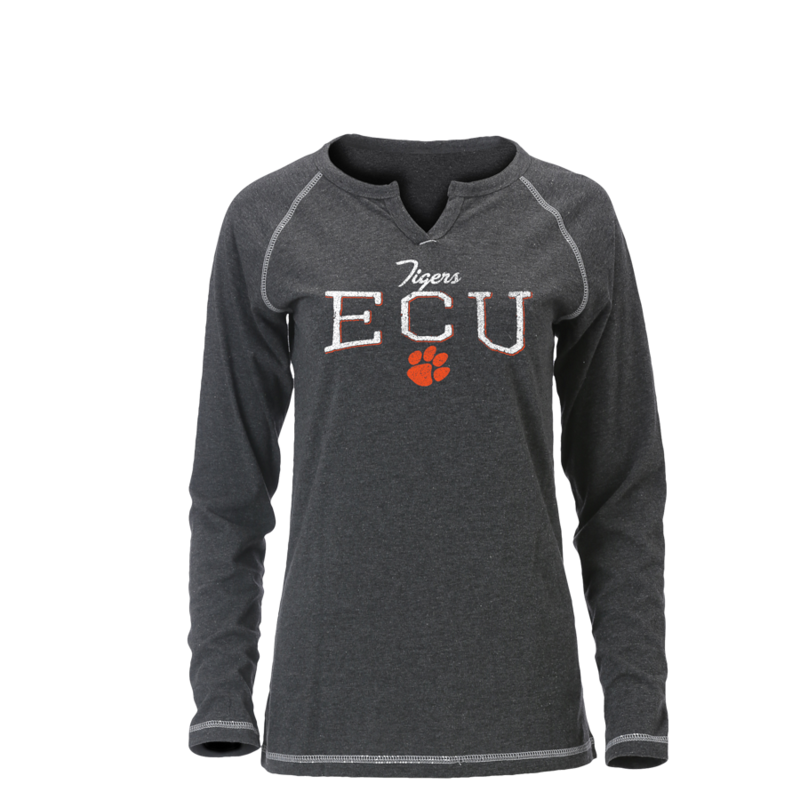 Dark gray body with "ECU Tigers" and a tiger paw printed on the front in white and orange. Please select option for Flowy Scoop Neck T-Shirt (Black). Please select option for Flowy Scoop Neck T-Shirt (Gray). Soft and comfortable long-sleeve T-shirt. Perfect for the cool weather of late fall/early spring or being used as a light layer in the dead of winter. 60% Cotton/40% Polyester fiber content. Gray body with "ECU Tigers" and a tiger paw printed on the front in white and orange. Super soft, 100% cotton fabric makes this shirt perfect for any weather! 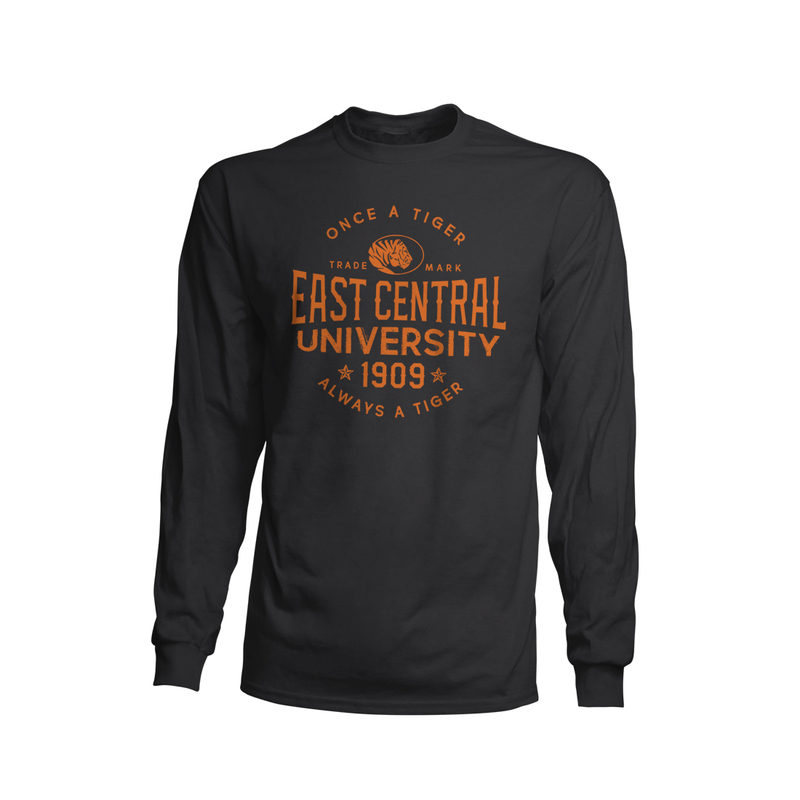 Black or gray body with "Once a tiger, always a tiger", University's founding date, and ECU Tiger logo printed on the front in orange. Please select option for Once a Tiger... Long-Sleeved T-Shirt. Please select option for Once a Tiger... Short-Sleeved T-Shirt.